For the fourth quarter of 2016, the Navigator Fixed Income portfolio lost 1.72% compared to a 2.07% loss for the Barclays Capital Intermediate Government and Credit Index. It was a very difficult quarter for bond investors, as the Barclays Aggregate Bond Index posted nearly a 3% loss, its biggest since at least 1994. Rising interest rates as a result of the Fed rate increase were the driver of returns, and the election provided a further boost to interest rates as growth expectations picked up. The portfolio fared well on a relative basis versus the benchmark, as our view has long been that credit risk is better rewarded than interest rate risk over the long run. Legg Mason BW Global Opportunities Bond (GOBIX) and Loomis Sayles Investment Grade Bond (LSIIX) were the top detractors, while Navigator Duration Neutral Bond (NDNIX) and the Barclays High Yield Bond SPDR (JNK) were the top contributors. We expect the portfolio to continue to favor credit over interest rate risk in 2017, though we expect the pace of interest rate increases to slow this year. The portfolio maintains a BBB credit rating overall, maximizing our income to the extent allowed by our risk parameters. For the fourth quarter of 2016, the Navigator Capital Preservation with Sentry portfolio lost 0.10% compared to a 2.62% loss for the Dow Jones Conservative Portfolio Index. The quarter was defined by two events: the Fed’s long awaited and telegraphed rate hike, along with the surprising election victory by Donald Trump. The portfolio was positioned aggressively with regards to risk assets coming into the election and enjoyed gains when our small cap value, high beta, Financial, and Industrials ETF holdings spiked higher after the election. The bond portion of the portfolio favored high yield and credit over Treasuries. Our models continue to show a solid if unspectacular economy and little chance of recession; credit markets maintained their strength throughout the quarter. Across the fixed income spectrum, there were few gains to be had as interest rates surged higher after the election and in anticipation of the Fed’s action. The quarterly loss of nearly 3% for the Barclays Aggregate Bond Index was the largest since 1987. Our position in high yield bonds again proved defensive and even profitable during the over 100 basis points increase in the 10-year Treasury between July and December. Hedging one’s equity exposure during a strong market for equities is an exercise in patience and understanding the proper role of a hedge in a broader portfolio. We continue our constant policy of providing a hedge for the portfolio at all times, while at the same time looking to reduce the costs of hedging by shorting volatility (in small, risk-managed trades). Looking forward into 2017, our stance remains mildly bullish for the first half of the year and then more uncertain for the second half. Political uncertainty remains high, as markets do not yet have a sense for what tax and budgetary changes a Trump administration will pursue. Still, there are very few signs of recession. Valuations, however, are of concern, and we will need to see companies deliver on what has become a now higher expected growth rate in order to keep moving markets forward. For the fourth quarter of 2016, the Navigator Conservative Growth portfolio with Sentry portfolio gained 0.80% compared to a 2.62% loss for the Dow Jones Moderately Conservative Portfolio Index. 2016 was defined by a first half that was risk-off, and a second half that was risk-on. This was not evident from the movement of the S&P 500 but from the movement in interest rates. Interest rates fell during the first half of 2016. In July after the Brexit vote, the 10-year Treasury hit its lowest level in decades. Risk-off stocks and bonds were top performers. However, since then Treasury yields rose over 100 basis points and small caps, Financials, Industrials, and Energy were market leading areas, particularly after the U.S. election. The portfolio did allocate heavily to small caps, value stocks, Financials, and Energy prior to the election, fueling gains. There were some losers in the portfolio’s alternative sleeve, however, as commodities, managed futures, long-term bonds, and gold declined on fears of higher interest rates. Hedging one’s equity exposure during a strong market for equities is an exercise in patience and understanding the proper role of a hedge in a broader portfolio. We continue our constant policy of providing a hedge for the portfolio at all times, while at the same time looking to reduce the costs of hedging by shorting volatility (in small, risk-managed trades). Looking forward into 2017, our stance remains mildly bullish for the first half of the year, and then more uncertain for the second half. Political uncertainty remains high, as markets do not yet have a sense for what tax and budgetary changes a Trump administration will pursue. Still, there are very few signs of recession. Valuations, however, are of concern, and we will need to see companies deliver on what has become a now higher expected growth rate in order to keep moving markets forward. For the fourth quarter of 2016, the Navigator Moderate Growth with Sentry portfolio gained 1.33% compared to a 0.63% loss for the Dow Jones Moderate Portfolio Index. 2016 was defined by a first half that was risk-off, and a second half that was risk-on. This was not evident from the movement of the S&P 500 but from the movement in interest rates. Interest rates fell during the first half of 2016. In July after the Brexit vote, the 10-year Treasury hit its lowest level in decades. Risk-off stocks and bonds were top performers. However, since then Treasury yields rose over 100 basis points and small caps, Financials, Industrials, and Energy were market-leading areas, particularly after the U.S. election. Within the portfolio’s equity core positions, we favored small caps (the size factor) and dividend growers. The portfolio did allocate heavily to small caps, value stocks, Financials, and Energy prior to the election, fueling gains. There were some losers in the portfolio’s alternative sleeve, however, as commodities, managed futures, long-term bonds, and gold declined on fears of higher interest rates. For the fourth quarter of 2016, the Navigator Growth portfolio gained 2.11% compared to a 0.99% gain for the Dow Jones Moderately Aggressive Portfolio Index. 2016 was defined by a first half that was risk-off, and a second half that was risk-on. This was not evident from the movement of the S&P 500 but from the movement in interest rates. Interest rates fell during the first half of 2016. In July after the Brexit vote, the 10-year Treasury hit its lowest level in decades. Risk-off stocks and bonds were top performers. However, since then Treasury yields rose over 100 basis points and small caps, Financials, Industrials, and Energy were market-leading areas, particularly after the U.S. election. Within the portfolio’s equity core positions, we favored small caps (the size factor) and dividend growers. Within the international equity positions, the portfolio hedged much of its currency exposure, as we view the dollar to be in a long-term uptrend. The portfolio did allocate heavily to small caps, value stocks, Financials, and Energy prior to the election, fueling gains. There were some losers in the portfolio’s alternative sleeve, however, as commodities, managed futures, long-term bonds, and gold declined on fears of higher interest rates. Our outlook for 2017 is mildly bullish for the first half of the year but more cautious during the second half of the year. Market valuations have become quite stretched, particularly in the small cap arena. That does not mean that a big bear market is imminent; in fact, we see very few signs of recession. Rather, the question is will the market resolve the high valuations by remaining flat while earnings catch up or face a decline if expectations have gone too far? Such a decline, if it were to occur, may be painful, but we would be likely to use it as a buying opportunity. We continue to see less risk and more opportunity in international markets. Like many, we have been pointing this out for some time and have been wrong. In the long run, we believe that the valuation gap between the U.S. and the rest of the world will provide some profitable opportunities for developed and emerging market investments in particular. For the fourth quarter of 2016, the Navigator Aggressive Growth portfolio gained 2.73% compared to a 2.26% return for the Dow Jones Aggressive Portfolio Index. 2016 was defined by a first half that was risk-off, and a second half that was risk-on. This was not evident from the movement of the S&P 500 but from the movement in interest rates. Interest rates fell during the first half of 2016. In July, after the Brexit vote, the 10-year Treasury hit its lowest level in decades. Risk-off stocks and bonds were top performers. However, since then Treasury yields rose over 100 basis points and small caps, Financials, Industrials, and Energy were market leading areas, particularly after the U.S. election. Within the portfolio’s equity core positions, we favored small caps (the size factor) and dividend growers. Within the international equity positions, the portfolio hedged much of its currency exposure, as we view the dollar to be in a long-term uptrend. The portfolio did allocate heavily to small caps, value stocks, Financials, and Energy prior to the election, fueling gains. There were some losers in the portfolio’s alternative sleeve, however, as commodities, managed futures, long-term bonds, and gold declined on fears of higher interest rates. Our outlook for 2017 is mildly bullish for the first half of the year but more cautious for the second half of the year. Market valuations have become quite stretched, particularly in the small cap arena. That does not mean that a big bear market is imminent; in fact, we see very few signs of recession. Rather, the question is will the market resolve the high valuations by remaining flat while earnings catch up or face a decline if expectations have gone too far? Such a decline, if it were to occur, may be painful, but we would be likely to use it as a buying opportunity. We continue to see less risk and more opportunity in international markets. Like many, we have been pointing this out for some time and have been wrong. In the long run, we believe that the valuation gap between the U.S. and the rest of the world will provide some profitable opportunities for developed and emerging market investments in particular. Through December 29th, the Barclays High Yield Index was up 1.74% for the quarter. That stands in stark contrast to a 3.22% loss for the Barclays Aggregate Bond Index. The longer-standing fears (and eventual reality) of a Fed rate hike combined with the surprising election of Donald Trump to boost growth expectations and consequently pummel the longer duration bond markets. The real story of the second half of 2016 was the over 1% surge in the 10-year Treasury rate, and that high yield was again shown to be a relative and absolute safe harbor within the bond space during times of rising rates. The 10-year Treasury bottomed on July 8th at 1.37% and rose to 2.60% by December 16th. During that time, the Barclays High Yield Bond Index rose 5.31% but the Barclays Aggregate Bond Index declined 4.38%. The two major high yield ETFs, HYG and JNK, gained 2.80% and 3.21% respectively; meanwhile the iShares 7-10 Year Treasury (IEF) declined by 8.29% and the Bloomberg Barclays Long-Term Treasury SPDR (TLO) declined an amazing 16.97%. As of December 29th, the resulting duration of the FITR portfolio is 3.69, with a current yield of 6.21%. The average maturity is 6.62 years, and average credit quality is B+. On the quarter, the portfolio’s top contributors were BlackRock High Yield Bond (BRHYX), Lord Abbett High Yield Bond (LAHYX), and the Barclays High Yield Bond SPDR (JNK). The portfolio’s top detractors were the Barclays Short-Term High Yield Bond SPDR (SJNK), PIMCO High Yield Spectrum (PHSIX), and JPMorgan High Yield Bond (OHYFX). For the fourth quarter of 2016, the Navigator Global Equity ETF portfolio gained 4.24% (3.47% net) compared to a 1.19% gain for the MSCI All Country World Index (ACWI). Within U.S. equity styles, the portfolio favored small cap value stocks, small caps in general, and high beta stocks. These areas were market leaders prior to the election and enjoyed gains as the market surged after the election. Within sectors, the portfolio overweighted Financials, Industrials, and finally has begun to build a position in Energy; Consumer Discretionary, Consumer Staples, and Utilities were entirely avoided. Among international equities, the portfolio favored Canada and Japan both hedged and unhedged. International markets continue to lag behind U.S. markets. A large valuation gap has developed between the U.S. and most other markets. In our opinion, such a gap is not predictive of short or even intermediate term returns. However, in the longer term, U.S. markets should offer muted returns in comparison to international or emerging equities. Our outlook for 2017 is mildly bullish for the first half of the year but more cautious for the second half of the year. Market valuations have become quite stretched, particularly in the small cap arena. That does not mean that a big bear market is imminent; in fact, we see very few signs of recession. Rather, the question is will the market resolve the high valuations by remaining flat while earnings catch up or face a decline if expectations have gone too far? Such a decline, if it were to occur, may be painful, but we would be likely to use it as a buying opportunity. We continue to see less risk and more opportunity in international markets. Like many, we have been pointing this out for some time and have been wrong. In the long run, we believe that the valuation gap between the U.S. and the rest of the world will provide some profitable opportunities for developed and emerging markets investments in particular. The market began the year 2016 front-end loaded with recession fears, declining earnings estimates, a 7.0% drop in the Chinese stock market and the introduction of negative interest rates by the Bank of Japan to name a few concerns. In the month of January, the S&P 500 Index declined 5.1% followed by the Dow Jones Industrial Index decline of 5.5% which was the worst start on record. Two major political surprises created buying opportunities: the British vote to leave the European Union (Brexit) and the Trump U.S. presidential victory both leading to strong market rallies. By the fourth quarter, the U.S. election, stronger U.S. corporate earnings estimates along with clarity from the Federal Reserve prompted the S&P 500 Index to rise 4.6%, locking in a gain of almost 12.0% while the Dow approached the historic 20,000 landmark, up 16.5% for the year. With the onset of higher rates, we maintain our focus on dividend growth stocks as the market rotates into mid/late cycle interest rate sensitive sectors. 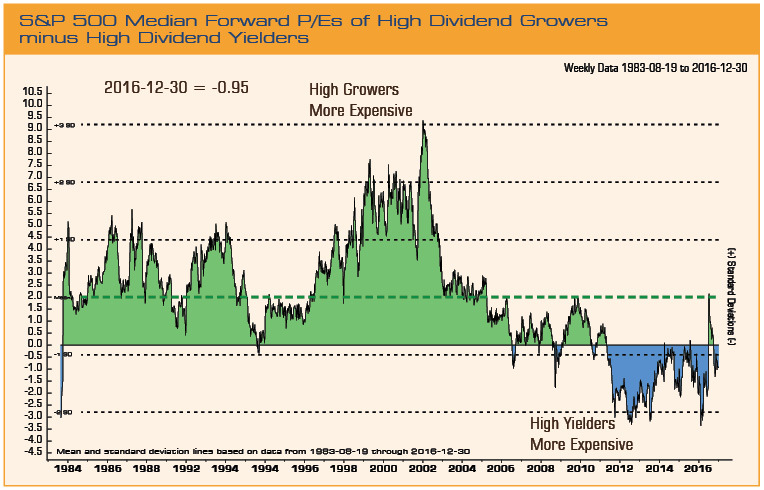 The chart below “S&P 500 Median Forward P/E of High Dividend Growers Minus Dividend Yielders” illustrates high yield stocks currently trading at expensive levels versus dividend growers which historically have been more expensive since the 1980s. The accommodative Fed policy produced historically low rates over the last five years which prolonged the sweetheart rally in the RUST sectors (REITs, Utilities, Staples and Telecom). This focus changed in 2016 but not before a massive outperformance of Utilities and Telecom in the first half of the year ending in July when the 10-year Treasury yield bottomed at 1.37%. By the fourth quarter, undervalued stocks in beaten down sectors such as Financials rose 21.1% followed by a rise in Energy of 7.28% and Industrials 7.21%. The worst performing sectors for the quarter were some of the biggest winners (and overvalued) during the last five years. They were: Healthcare down 4.0%, REITs lower by 3.1% and Staples declining 2.02%. *Performance shown is net of fees based on the CL 5 sha res. Your investment may have higher or lower fees than the CL 5 shares. Please contact your representative for additional information about the performance of other classes of shares available for investment. The S&P 500 Index measures the performance of the 500 leading companies in leading industries of the U.S. economy, capturing 75% of U.S. equities. Barclays Capital U.S. Intermediate Government/Credit Bond Index measures the performance of U.S. dollar denominated U.S,. Treasuries, government-related and investment grade U.S. corporate securities that have a remaining maturity of greater than 1 year and less than 10 years. MSCI World Index is a broad global equity benchmark that represents large and mid-cap equity performance across 23 developed markets countries. The MSCI ACWI stands for All Country World Index. A market capitalization weighted index designed to provide a broad measure of equity-market performance throughout the world. The MSCI ACWI is maintained by Morgan Stanley Capital International and is comprised of stocks from both developed and emerging markets. The CBOE Volatility Index® (VIX®) is a key measure of market expectations of near-term volatility conveyed by S&P 500 stock index option prices and which shows the market’s expectation of 30-day volatility. It is constructed using the implied volatilities of a wide range of S&P 500 index options. This volatility is meant to be forward looking and is calculated from both calls and puts. The VIX is a widely used measure of market risk.